I am happy to report that I survived my first Valentine’s day as a single lady since 2002. Despite all the focus put on the romantic kind of love that usually accompanies February 14th, I decided that this year, I would celebrate the love that only being a parent can bring. I consider myself very blessed to have a very special person in my life. Sure, instead of sharing our love over a four course meal and expensive wine, it’s more likely to be done over macaroni and chocolate milk, but I still wouldn’t trade it for the world. We started off the day with heart shaped pancakes. Of course, those pancakes that I worked so hard to make into hearts quickly had bites taken out of them and morphed into moons, birds, and dolphins, but it’s the thought that counts, right? After breakfast, I dressed her up in her most Valentine’s Day appropriate outfit and dropped her off at her preschool for her first real Valentine’s Day party. She was incredibly excited to hand out to all her friends the valentines we’d been working on for the last several weeks (have you ever sat down with a 3 year old to make 20 valentines? We were lucky to get 4-5 done in a sitting before she was distracted by something shiny). After class, we made an impromptu trip to the store to pick up flowers and dessert. The tulips found a home on the kitchen table and the cake was split while watching Blues Clues together for lunch (mother of the year, right here). Our perfect girls only Valentine’s day was topped off with our own little dinner for two. The menu, some good old fashioned comfort food… vegetarian chili and corn bread muffins. Both recipes I found on allrecipes.com. I made some minor adjustments to the chili recipe. I threw in a couple of jalepenos since I like a little heat in my chili. I also cooked for 3 hours on high in my slow cooker and the beans were cooked perfectly. I prepared the cornbread recipe as written, only I used a muffin pan instead of a square pan to bake it in and decreased the cooking by a few minutes. The chili turned out great. The baked beans had me a little nervous, but the sweetness mixed well with the other flavors and gave it a little hint of a smokey flavor. The cornbread was amazing!! Probably not the healthiest food, but you can’t have chili without corn bread. Both recipes are below in case you are looking for a satisfying, quick, comforting weeknight meal that can be prepped ahead of time. 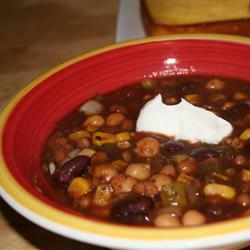 In a slow cooker, combine black bean soup, kidney beans, garbanzo beans, baked beans, tomatoes, corn, onion, bell pepper, jalepenos, and celery. Season with garlic, chili powder, parsley, oregano and basil. Cook for at least two hours on High. Preheat oven to 400 degrees F (200 degrees C). Spray or lightly grease a 9 inch round cake pan or muffin pan. Bake in preheated oven for 20 to 25 minutes (15-20 min for muffins), or until a toothpick inserted into the center of the loaf comes out clean.